The weather outside is frightful. Surprise your favorite wine drinker with a virtual trip to coastal Spain where these three charming wines will lubricate the imagination and transport them to the breezy Mediterranean shores and Barcelona cafés of the autonomous community of Catalunya. 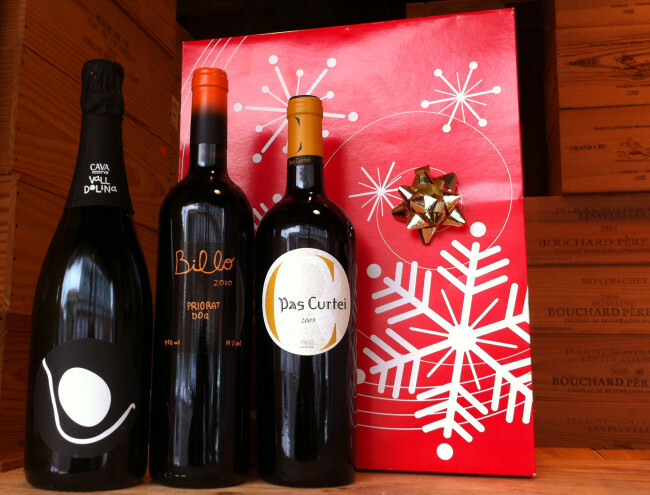 Not only are these wines of utmost quality that typify the region, they will also be attractively boxed and wrapped to make a perfect gift for a holiday gathering or to place under a tree. The visionary winemakers Raimon Badell and Ferran Gil of Masia Can Tutusaus combine superior geography with their artistry and skill to craft this sparkling white wine made in the Champagne method. Here is a scandalously drinkable wine that radiates aromas of apple blossom, wheat crackers, and sunshine, with a complex finish that sometimes doesn’t exist in sparkling wines twice the price. At the age of 22, while many young men are still shotgunning cheap beer with their buddies, young winemaker Blai Ferré Just purchased two small lots in Priorat to start Billo. He purposely limits output, relying only on the ﬁnest fruit grown in his vineyard. For 2010, this means only 6,500 bottles were produced, and only about a third of that imported to the United States. The result is a wine of intensity, ripeness and balance. Partners in marriage and in the vineyard, Irene Alemany and Laurent Corrio met at the University of Burgundy in Dijon and apprenticed in vineyards in both France and California. Irene’s father insisted they use the family vines to begin their own operation. The rest, as they say is history. The 2009 Pas Curtei is a full-bodied wine with red and black fruit aromas. Only 8,500 bottles were produced, 600 made it to the U.S.